I had an opportunity to go through the lessons for the second edition in late January and make some small improvements. The updated PDF file is now available on the page above entitled “The Second Edition” as well as through Gumroad.com and the IB Online Curriculum Centre’s Teacher Resource Exchange. I am also pleased to report that some of my articles from the Pembroke Daily Observer are now posted on the Ludwig von Mises Institute’s website. I invite you to check out the site as there are many interesting articles and readings there with an Austrian school flavour. I wish you all the best as you move with your students into the final innings. The View from the Top looks at the (in my view, flawed) rationale behind the inflationists’ efforts. I am writing today to explain why I am only selling teachers’ guides along with class sets of at least 10 copies of the student exercise book. 1. 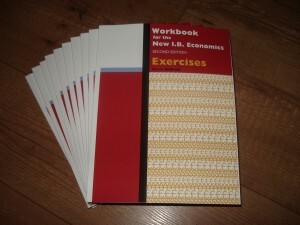 The book is intended to be used as a consumable student workbook. The very affordable class set price of $22 per copy to overseas addresses reflects this. When used in conjunction with the free online lessons the book is the best learning tool for I.B. economics available. Your students will benefit greatly from being issued their own copy at the beginning of the course and using it throughout the two-year program. 2. However, if you don’t have the budget to buy copies for your students every year, it is fine to use the book as a class text and reissue it to each new cohort of students and have them answer the problems in their notebooks. I understand that some schools have tight budgets that leave teachers with few options. 3. However, what I am not prepared to support is teachers using the book as a photocopy master. If the book is good enough to use with your students, it is good enough to purchase for your students. As the cost to photocopy the exercises in the book would be about the same as the $22 purchase price, it just doesn’t make sense to make photocopies, especially if you take into account time spent at the photocopier. I hate to be a nag, but it is useful to be reminded that significant time, effort and money went into producing Workbook for the New I.B. Economics, 2nd Edition. When you choose to purchase the book, you are honouring that fact and making it possible for me to continue to produce useful and affordable educational materials. Thank you for your support. 1. It is engaging and demands that students DO a bit of economics every day, not just read about it. While other books may have some multiple choice or short answer questions at the end of each chapter, only Workbook for the New I.B. Economics, 2nd Edition has graphing and analysis questions to support each of its 82 lessons, questions for review and extension every 6 or 7 lessons and 4 extensive sets of Paper 3-style quantitative questions. 2. The scope (a page or two long each) and sequence of the lessons permits many students to learn the course with a great deal of independence. This is especially valuable for schools where I.B. economics is being taught alongside A.P. or national curriculum courses. Of course, the value proposition is compelling as well – in North America student copies ordered as part of a class set are just $17, while for schools on other continents the price is still a very reasonable $22. Due to the conveniently sized ‘board game’ airmail box offered by the USPS, I am pleased to offer overseas schools the class set price of $22 per copy for orders of 15 books or more. To learn more, please click on the link above entitled “The Second Edition.” To have a look at the book’s free online lessons, click on the link in the post below from September 26th. …where you will receive not just a PDF of lessons but also sample pages from the student exercise book and teachers’ guide. While Gumroad asks you to provide credit card information before you can download the file, the file itself is free – $0. The benefit of your downloading the file from Gumroad is that I will be able to contact you if I make necessary changes to the book or if I make additional resources available. If you are a teacher and want to download the file and then share it with your students on an internal file server to save them the bother of downloading their own files that is fine as I will still be able to contact you through Gumroad to pass on information to your students. As you can see, the new edition is a significant improvement on the first edition released in 2011. To give a quick taste of the accompanying exercise book, I have put the table of contents and exercise 63 from the new book below. As you can see, there are as many pages of questions in the new exercise book as there were total pages in the old integrated textbook/workbook. I hope that after having had a look at the lessons and the samples from the exercise book that you will decide to buy copies for your students. While you are welcome to purchase an inspection copy of the student exercise book, please be aware that the teachers’ guide can only be purchased by schools that have ordered at least a single class set of student exercise books. I received the exercise books from the printer today (and the teachers’ guides a couple of weeks ago), and should be able to make the electronic lessons available later this week. I would like to thank my wonderful graphic designer, Marisa Scaramella, and the fabulous team at Marquis Imprimeur for all of their help. While I continue to lament my loss of Oman Post’s international airmail printed matter rate, I am pleased to share that due to my membership of Canada Post’s Venture One small business program the international airmail (with tracking) postal charges for books ordered as part of a class set of at least 20 come in at around $8/book, making the total cost per book (my price of $12 plus $8 shipping) around $20 per copy. For a 192 page book of exercises supported by freely available online lessons, this remains a very attractive price. I look forward to receiving the books from the printer in the next week or so. I will be sure to announce their arrival when they come. Due to some changes to do with the ownership structure of the printer I employ (ex-Transcontinental, now Marquis) there has been a further slight delay, however I should have the books ready to ship by the end of June or early July. So, again, if you would like to look at an inspection copy of the new edition, send me an email to bryce@brycemcbride.com with your full postal address, the number of copies you require, and your preferred method of payment (cheque drawn on a North American bank or credit card). Note that the teachers’ guide with the full solution key will only be made available to those schools ordering class sets of the student book. If you plan on taking your summer vacation in North America, I would be happy to mail your copy to your summer address in order to save you postal costs. The second edition is almost finished! If you plan on coming to Canada or the U.S. during the summer holidays, I would be happy to send books to your North American address to cut down on postage costs. The teachers’ guide is priced at $20 per copy plus postage. I am restricting the sale of the teachers’ guide to schools ordering class sets of the book as the answers to selected exercises will be included in the student book. Thanks again for your patience. I will be sure to let you know when the books are delivered and ready to ship.